“A people that does not have land, does not have life,” said Luis Alberto Bautista, an indigenous Ecuadorean pastor who serves as the indigenous ministry coordinator for the Latin Council of Churches. He spoke last week to visiting U.S. divinity school students about the spirituality and political involvement of Ecuador’s indigenous communities, which make up 21 percent of the country’s 14.6 million population. Many of Ecuador’s indigenous people, including those living in the Andean highlands, lost their land during the Spanish conquest of the 16th century. They were forced to work as slaves on large farms, or haciendas, owned by Spanish landlords. 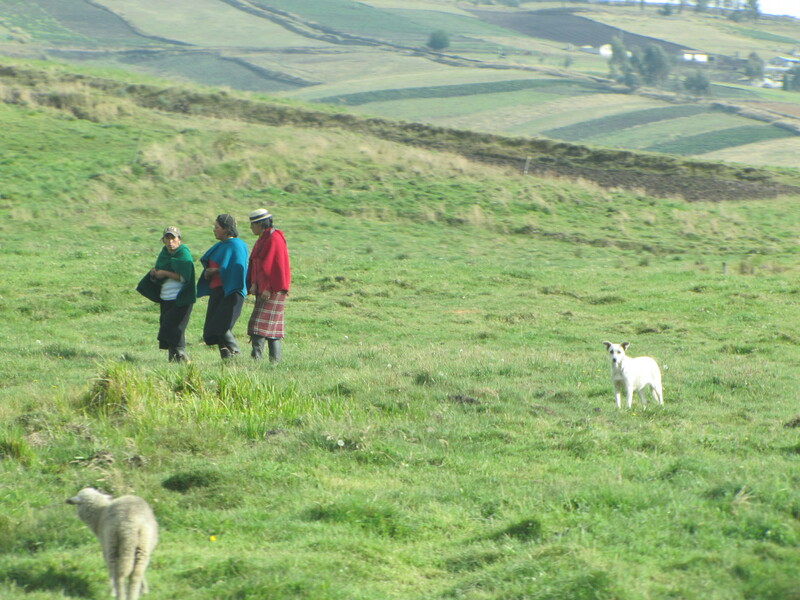 Political organization of indigenous Ecuadorians during the 1940s led to agrarian reform, which restored some land to indigenous communities. But sociologist Luis Alberto Tuaza is quick to point out that indigenous people were given ownership of high-altitude land with poor, sandy soil rather than the fertile valleys below. I recently traveled to the small Andean town of Guamote, where 95 percent of the population is indigenous. Campesinos wandered through the cobblestone streets wearing felt hats with peacock feathers, turquoise, green and magenta shawls (women), red ponchos (men) and other traditional dress. The town, located in one of the poorest counties of Ecuador, is surrounded by terraced hillsides planted with corn, barley and potatoes. Some of the land is held by individuals and some by the community. Theologian Julian Guaman talks to students. A thatched-hut in a high-altitude village. A woman herding a cow. Village boys sit in front of a 200-year-old church. A young indigenous girl in traditional dress. Terraced hillsides planted with crops. An indigenous man leaves a church meeting on his motorcycle. The streets of Guamote before a storm. Corn grows in a gated yard. Indigenous church leaders talking after a meeting. A woman listens during an indigenous church meeting. Village women sweep outside a community building. Very nice to find your blog and hear about Ecuador. Looking forward to more. Becky, great to see you are writing on the road. Thanks for sharing these experiences! I feel like I’m there with you (and I wish I were!). Great photos, too… are you able to talk with people? How is your Spanish coming?